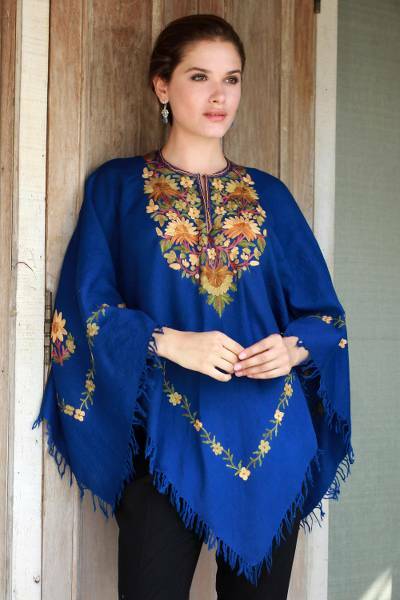 Indian 100% Wool Poncho in Royal Blue with Aari Embroidery, "Majestic Garden"
Indian artisan Sajad designs this majestic poncho in a royal blue color. The poncho features aari embroidery, which is a specialty of Kashmiri artisans dating back to 12th century. A magnificent floral and leafy pattern is crafted on the front panel around the neckline and borders the ends of the poncho in shades of brown, mustard and green. 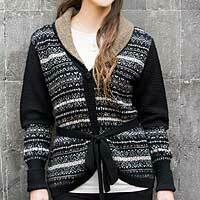 This 100% wool garment is accented by fringes.